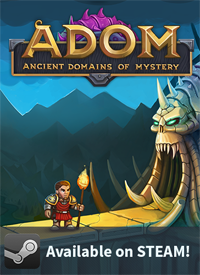 The Official Blog for ADOM (Ancient Domains Of Mystery): ADOM made the IndieDB Top 100 - now let's try to win! ADOM made the IndieDB Top 100 - now let's try to win! Click on the roguelike category on the page that opens. During 2017 we managed to release 14 (!) new versions of ADOM. We have added dozens of new quests, hundreds of new items and artifacts as well as many new monsters and other mechanisms. We have hugely revised the UI (user interface) to make the game a lot more accessible to new players. In the last six months alone we have processed 838 tickets (RFEs, bugs, etc.). We have published 40 blog postings and hundreds of other social media postings to inform and grow the community. We intend to finish all our crowdfunding promises by the end of this week. 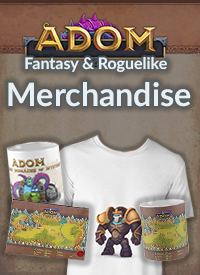 In doing so we have sent out thousands of physical rewards from the crowdfunding campaign into the world (ADOM Lite RPG, ADOM RPG boxes, postcards, code certificates and so much more). We just released the first beta version of our Rogueleague.org community server (http://rogueleague.org). We have managed to get funding in order to hopefully produce the ultimate next-generation roguelike experience: Ultimate ADOM. 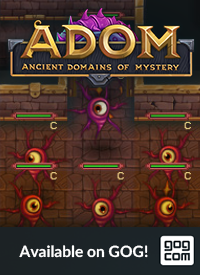 So ADOM is more alive than ever! And now we need your voices to be heard in our quest to carry true roguelike gaming into the mainstream. Please vote for ADOM as your support means more to us than anything else! Voted twice for ADOM, each time you called it to our attention.